Gentoo Forums :: View topic - [solved]Gnome 3.10. Where are suspend and hibernate gone? [solved]Gnome 3.10. Where are suspend and hibernate gone? Posted: Sun Dec 29, 2013 1:22 pm Post subject: [solved]Gnome 3.10. Where are suspend and hibernate gone? Gnome 3.10. Where are "suspend to ram" and "hibernate to disk" gone? After the upgrade from 3.8 to 3.10, these settings are lost. Can I get the old system status menu back without downgrading? But what? "suspend to ram" or "hibernate to disk". Where can I check this? in gnome-tweak-tool "energy" I can adjust that. But only either or, but not both. Sigh. Some people know when they want to suspend vs hibernate (if both work on your computer), Gnome3 assumes you want to only do one or the other. I saw on previous versions of Gnome that you could use gnome-shell-extensions-alternative-status-menu but it looks like it's gone in 3.10. - Can't choose between suspend or hibernate - I know when I'll use my computer next, if I know it will be within an hour, I want to suspend. If it will be tomorrow, I'll hibernate. The OS has no way of knowing it and shouldn't force one to choose. Alas no, it does not seem to do the trick. 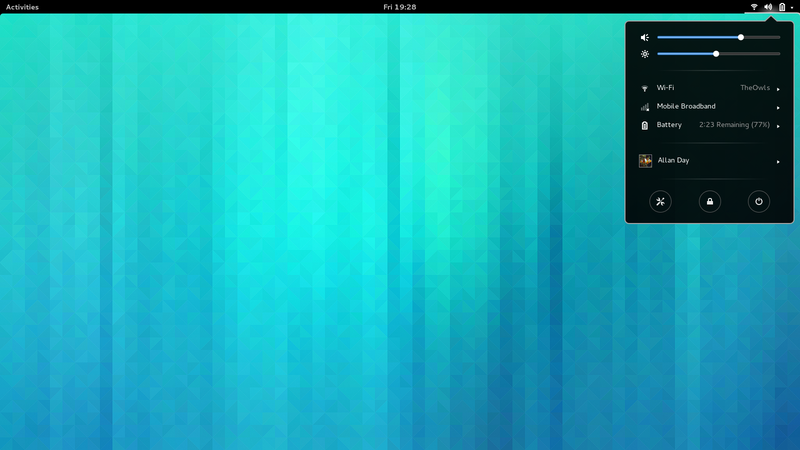 But it looks interesting - gnome shell. Maybe I can hack this to do what I want...hmm.